Barbecue Recipes – Barbecue Recipe – Easy Barbecue Recipes | Cook Eat Delicious! Charcoal grill or Gas grill? Choose your Barbecue and cook up some of these Delicious Barbecue Recipes. Burgers, Ribs, and all the fixins’ to help your barbecue taste as good as it looks! Not into meat? Don’t worry! I have a collection of barbecued recipes. entrees and sides, that are also easy to prepare and perfect for vegetarians and vegans. Why not try our Bean Burger or Seitan Ribs. Need a good barbecue sauce recipe? Look no further than here, I have the best barbecue sauce recipe ever! Let me know your favorite barbecue recipe and how you like to prepare it! Last month I put up a recipe for Hawaiian Pulled Pork that is one of many of the different easy pulled pork recipes I have been cooking. This Kansas Pulled Pork recipe is my favorite one yet. 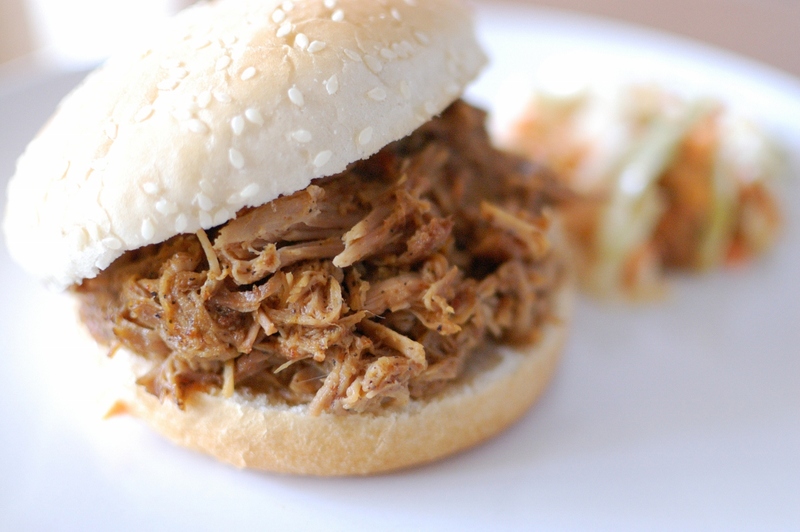 I love pulled pork because you don’t really have to do anything to cook up a delicious meal. Just season the pork, put it over some heat, and let it cook for a few hours. Easy & Simple. Delicious Rating: This is some delicious pork! The seasoning is spot on to give it a deep smoky flavor with a little bit of spice. I cook mine in a dutch oven on the stove and it turns out succulent every time. I serve it on a bun with some Red Cabbage Cole Slaw…or eat out of the pot with a fork, still good! You read the title correctly. 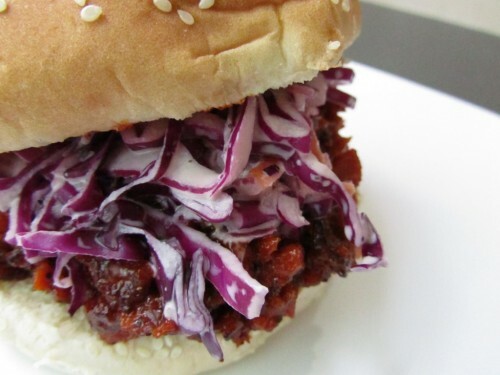 This is a recipe for Barbecued Pulled Seitan Sandwiches. No, not pulled pork, but pulled seitan. Can you really substitute meat? My DH would say no, although we have been eating seitan in different recipes for awhile now. But can you replace something like pulled pork? I mean come on…it is succulent pork we are talking about! Yes, we can…and it tastes just as delicious. Delicious Rating: I think most wouldn’t know that this recipe had a meat substitute in it. Altogether, the sandwich comes together so well in this easy recipe. Browning and adding some crispy edges to the seitan really gives it the “meaty” touch. But with the BBQ sauce and coleslaw, I doubt you are really thinking about what you are eating, you are just thinking about eating it because it smells and taste delicious! What is your favorite Seitan recipe? 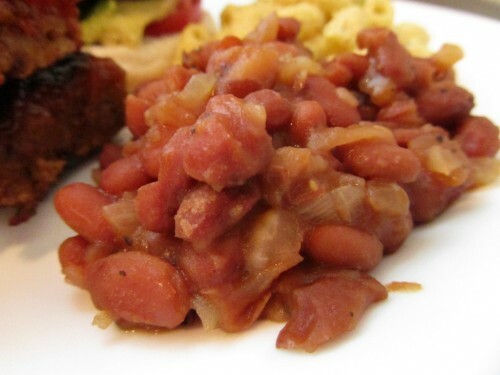 The best part about a Barbecue are the Baked Beans. 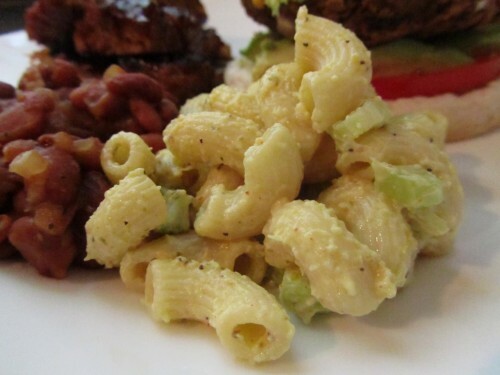 I love the sweetness of the beans running off into the potato salad or pasta salad on the plate. Yummy! These beans may be some of the best baked beans I have ever cooked. Plus, they are Vegan! Delicious Rating: Easy recipe to make and bake. Not too sweet at all but has a nice flavor to it. They are thick and not super saucy but if you like a lot of sauce you can double the recipe for sauce. Serve with Vegan Pasta Salad, Seitan Ribs, and Bean Burgers for a complete dish. I don’t like pasta salad. I never put it on my plate at the BBQ party or in a buffet line. I mean whose to know what the creamy sauce is really made up of…old warm mayo always comes to my mind! When I had my Vegan Barbecue I was really having a difficult time wrapping my head around the idea of tofu-potato salad. But then it occurred to me to make a tofu-pasta salad. I mean, I never know what the sauce of a pasta salad is made of anyways. Delicious Rating: This pasta was an easy recipe to cook up and tastes great! I really liked the spice from the cayenne pepper, it wasn’t dominate but you could definitely feel the kick! This is the perfect Vegan BBQ Side dish and is a keeper in my home!